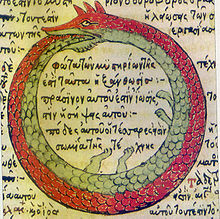 Drawing by Theodoros Pelecanos, in the alchemical tract Synosius (1478). ↑ Neumann, Erich. (1995). The Origins and History of Consciousness. Bollington series XLII: Princeton University Press. Originally published in German in 1949. ↑ Greek Οὐροβόρος o οὐρηβόρος, mula sa οὐροβόρος ὄφις "tail-devouring snake", pronounced IPA: /jʊəˈrɒbɔrəs/ ew-ROB-or-əs, /jʊərɵˈbɒrəs/ ewr-o-BORR-əs, or /ɔˈrɒbɔrəs/ or-ROB-or-əs in English. Huling pagbabago: 10:57, 17 Hulyo 2018.